Customs and Border Protection allowed 20 migrants from the caravan to enter the country with the help of two members of congress from Los Angeles. 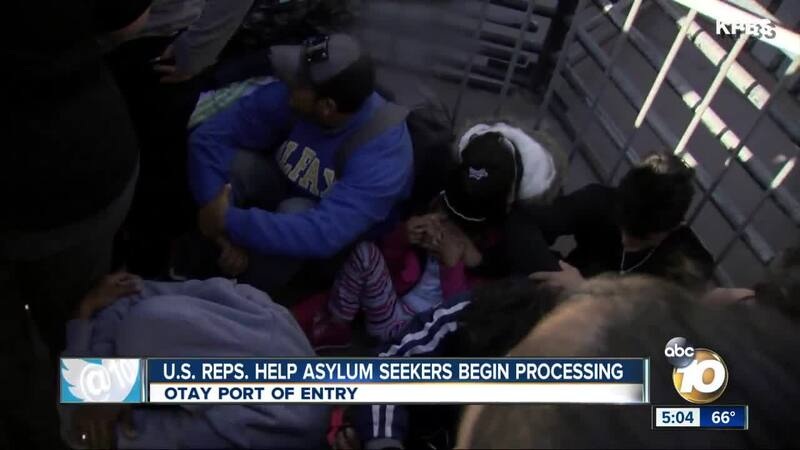 TIJUANA, Mexico (AP) — The asylum claims of six Hondurans were accepted for processing Tuesday, ending a 17-hour standoff involving U.S. authorities, the migrants and two U.S. lawmakers supporting them on a tiny piece of American soil at the country's border with Mexico. The Hondurans had camped out in an area of San Diego's Otay Mesa border crossing past where pedestrians pass a wall plaque delineating the international boundary but before they reach inspectors. They were joined by U.S. Reps. Nanette Barragan and Jimmy Gomez, both California Democrats. "They're on U.S. soil, and they're basically being blocked for presenting themselves for asylum," Barragan said in a video posted on Twitter that she said was taken around 2:40 a.m.
"Children are sick, they're crying, they've had to use the bathroom," Nicole Ramos, an attorney at Al Otro Lado, a legal services organization working on behalf of the migrants, said Monday night. "We've had to get blankets and food for them." The impasse highlighted a U.S. practice to limit entry for asylum seekers at official crossings when they are at full capacity, which it calls "metering" or "queue management." Authorities emphatically deny they are turning away asylum seekers — something that is prohibited under U.S. and international law — and say they are simply asking them to temporarily wait in Mexico. In San Diego, U.S. authorities funnel asylum claims through the San Ysidro port of entry, the nation's busiest crossing. Asylum seekers themselves manage waiting lists in a tattered notebook on the Tijuana side. People who appear at the city's other crossing, Otay Mesa, are normally redirected to San Ysidro. But Monday's group managed to reach U.S. soil, which usually means they are transferred to San Ysidro to have their claims processed immediately.